RAB Manufacturing provides clients locally in Brisbane and other locations in Australia with on-time delivery of precision machined metal components and fabrication work. All projects undertaken are subject to strict quality control processes. In addition to production runs, RAB Manufacturing can readily cater for one-off parts or customised prototypes, simple and complex components. RAB Manufacturing can also offer clients specialist consulting services for new product development, machining programming and technical drawings. We can design parts with the customer to best suit specific requirements. RAB Manufacturing now offers our clients industrial Engraving services. With the use of a precision engraving machine and professional engraving software we are able to deliver high quality labels and signage to our customers. We have access to a wide range of engraving materials, colours and finishes and will meet all your engraving needs with a fast turn around time. For further information on new industrial engraving services, click here. The PE Cell Mount Part Number PCM-2520-0 was designed and manufactured by RAB Manufacturing Pty Ltd. It gives greater water resistance over other fittings with its double O ring construction and plastic compression washer. The stainless steel body and brass nut gives it a high corrosion resistance. The brass nut gives greater ease of fitting and removal of the fitting. Click here for images of our PE Cell Mount PCM-2520-0. Only available at RAB Manufacturing. 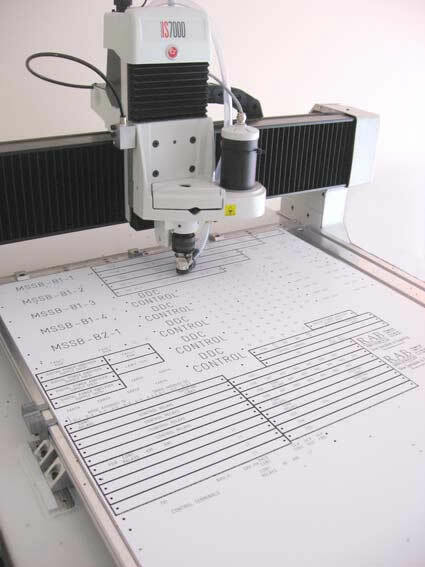 The CNC Machining Centre allows for high accuracy and ease of repeatability in manufacturing complex components. The Machining Centre is complimented by the Three Axis CNC Lathe with a 65mm diameter bar feeder. This state-of-the-art CNC Milling / CNC Turning / CNC Machining and associated equipment, together with the experience and skill of highly qualified staff, enables superior quality and high speed precision machined materials, (which range from stainless steel and aluminium to delrin and cast iron) . We supply to a wide range of clients and industries. RAB Manufacturing Pty Ltd is an innovative, customer focused machining shop, committed to providing the highest quality product possible. RAB Manufacturing's mission is to provide clients with superior, high quality machined components and reliable workmanship. These components will always be trusted to display performance, appearance and reliability in accordance with RAB's tradition of high quality manufacturing standards and in accordance with specifications provided by the client. Top quality materials are used and the product will be delivered to meet your schedule. Listening, communicating, designing, programming, turning out and delivery of the finished product. In the future, RAB Manufacturing hopes more manufacturing will be brought back to Australian shores to provide high levels of quality and service to customers and in turn, provide opportunities for the youth of Australia by way of employment and training. Contact our friendly staff today with your enquiries for CNC Machining or Industrial Engraving. Ph: (07) 3390 4461.